“Aquariums are a wonderful way to study the amazing richness and diversity of life to be found in the world’s rivers and oceans while learning more about the environment,” Kate explained to the pupils. Fish are known to have a tranquil, calming effect on kids. They’re beautiful and soothing to watch, and they’re fun to have around. As much as it’s fun and educational to keep fish in your classroom – just like other animals – pet fish depend upon us for their wellbeing. A well-decorated tank is not only pleasant to look at, but it’ll also give the fish an interactive habitat. And happy fish will be more alert, more active, and more colourful, and will live longer. That’s why, for the visit, Kate brought along some rocks, woodwork, and artificial plants for the pupils to decorate the tank with – to help the goldfish feel more at home. To keep the goldfish entertained with a varied habitat, Kate also left behind a few extra decorative bits and pieces that the kids could use to switch up the tank design every so often. 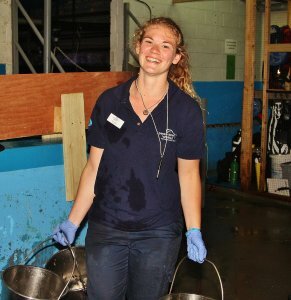 Before wrapping up the visit, Kate went over the importance of routine aquarium maintenance, including testing the water, doing regular water-changes, and checking the filter placement – carrying out these simple tasks weekly can keep expensive and time-consuming problems at bay. The better care you provide for your tank, the healthier your fish will be, the nicer your tank will look, and the less maintenance your tank will need in the long run. With more than 40 naturally-themed displays, Deep Sea World is home to thousands of deep sea creatures – ranging from seals and seahorses, to stingrays and sand tiger sharks – providing a voyage of discovery through the planet’s rivers, lakes, and oceans. You can get in touch with us on social media; just shoot us a message on Facebook or send a tweet to @DeepSeaWorld. Alternatively, you can call our team on 01383 411 880 to arrange a school trip – where underwater adventure awaits!